Six years ago federal agent Samantha Moon was the perfect wife and mother, your typical soccer mom with the minivan and suburban home. Then the unthinkable happens, an attack that changes her life forever. And forever is a very long time for a vampire. 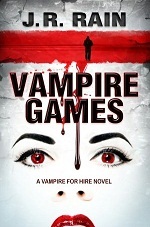 Now in Vampire Games, Samantha Moon is hired to look into the suspicious death of a popular fighter - and quickly discovers there's far more to the story than meets the eye. As she uncovers clues into the boxer's past, she will come face-to-face with something unexpected...and something only whispered about. Additionally, Samantha must confront the growing supernatural powers of those closest to her - and a betrayal that will rock her world.